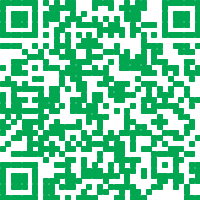 Thank you for visiting the Internet home of Delikon, Specialists in flexible conduits. 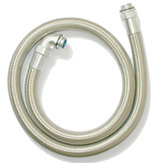 As an industrial leader, the company produces an outstanding range of metallic and non-metallic flexible conduits as well as complementary fittings and other electrical wiring accessories. Grey PVC coated liquid-tight flexible steel conduit is used extensively in the machine tools and ideal for rail way systems wirings. Semi Conduits, a Delikon manufacturing facility, produces superior quality flexible conduit systems for the World Wide cable management markets. Comprise a standard conduit construction, with metallic overbraiding, making them particularly suitable for off shore and heavy industrial wiring applications. Braided-shield flexible conduit, SCREEN FLEX: Clean data transmission in a noisy environment is an ever-increasing requirement on today crowded factory floors. Variable-speed motors operating near data cables are a common occurrence - so is Radio Frequency interference. 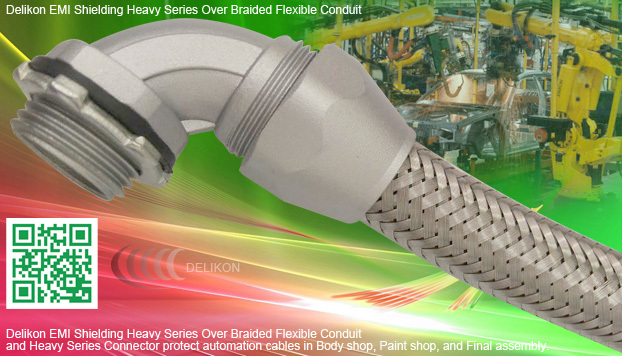 Delikon braided-shield flexible conduit provides excellent Radio Frequency, as well as mechanical protection to the wirings and cables, resulting in improved data transmission.